This is a list of African cuisines. A cuisine is a characteristic style of cooking practices and traditions, often associated with a specific culture. The various cuisines of Africa use a combination of locally available fruits, cereal grains and vegetables, as well as milk and meat products. In some parts of the continent, the traditional diet features a preponderance of milk, curd and whey products. The continent's diverse demographic makeup is reflected in the many different eating and drinking habits, dishes, and preparation techniques of its manifold populations. Congolese cuisine (Democratic Republic of the Congo) varies widely, representing the food of indigenous people. Cassava is generally the staple food usually eaten with other side dishes. Centrafrican cuisine in the Central African Republic includes Middle Eastern and French influences. Burundian cuisine - Burundi is situated in Eastern Africa and has a territory full of mountains, savannas and agricultural fields, with forests in the surrounding of rivers and waters. Agriculture is spread on 80% of the country's surface and it especially includes coffee, tea, corn, beans and manioc. 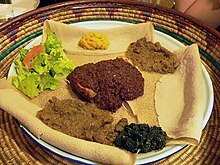 Ethiopian cuisine and Eritrean cuisine characteristically consist of spicy vegetable and meat dishes, usually in the form of wat (or wot), a thick stew, served atop injera, a large sourdough flatbread, which is about 50 centimetres (20 inches) in diameter and made out of fermented teff flour. Ethiopians eat with their right hands, using pieces of injera to pick up bites of entrées and side dishes. Utensils are rarely used with this dish. Somali cuisine varies from region to region and is a fusion of native Somali culinary traditions with influences from Yemeni, Persian, Indian and Italian cuisines. Tanzanian cuisine - Along the coastal regions (Dar es Salaam, Tanga, Bagamoyo, Zanzibar and Pemba), spicy foods are common, and there is also much use of coconut milk. Regions in Tanzania's mainland also have their own unique foods. Maasai cuisine - The staple diet of the Maasai consists of cow's milk and maize meal. The cuisine also consists of soups from plants and fruits. More recently, the Maasai have grown dependent on food produced in other areas such as maize meal, rice, potatoes, and cabbage (known to the Maasai as "goat leaves"). North African cuisine includes cuisines from regions along the Mediterranean Sea, inland areas and includes several nations, including Algeria, Egypt, Libya, Morocco, and Tunisia. In North African cuisine, the most common staple foods are meat, seafood, goat, lamb, beef, dates, almonds, olives, various vegetables and fruit. Because the region is predominantly Muslim, halal meats are usually eaten. The best-known North African/Berber dish abroad is surely couscous and tajine. Algerian cuisine is a distinct fusion of Berber, Ottoman and Mediterranean cuisines. Sudanese cuisine varies by region and has been influenced by the cross-cultural influences upon Sudan throughout history. 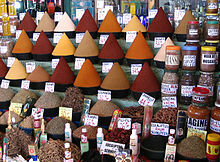 In addition to the indigenous African peoples, the cuisine was influenced by Arab traders and settlers during the Ottoman Empire, who introduced spices such as red pepper and garlic. Botswana cuisine is unique but also shares some characteristics with other cuisine of Southern Africa. Examples of Botswana food include pap, samp, vetkoek and mopane worms. A food unique to Botswana includes seswaa, heavily salted mashed-up meat. Malagasy cuisine is the cuisine of the island country of Madagascar, located in the Indian Ocean off the southeastern coast of Africa. Madagascans are mostly Malayan Polynesian, along with Africans, Arabs, Indians and Europeans. Rice is a common staple food, and fruits and vegetables are prominent in the cuisine. Pineapples, mangoes, peaches, grapes, avocados and lychee are grown on the island. Meats include chicken, beef and fish, and curry dishes are common. A common food is laoka, a mixture of cooked foods served atop rice. Laoka are most often served in some kind of sauce: in the highlands, this sauce is generally tomato-based, while in coastal areas coconut milk is often added during cooking. Namibian cuisine is the cuisine of Namibia. It is influenced by the cookery practiced by indigenous people of Namibia and settler cookery introduced during the colonial period by people of German, Afrikaner and British descent. Nigerian cuisine - Like other West African cuisines, it uses spices and herbs in conjunction with palm oil or groundnut oil to create deeply flavored sauces and soups often made very hot with chili peppers. Nigerian feasts are colorful and lavish, while aromatic market and roadside snacks cooked on barbecues or fried in oil are plentiful and varied. Centrafrican cuisine is the cooking traditions, practices, foods and dishes associated with the Central African Republic. The diet is heavy on staple starches such as millet and sorghum, and utilizes a significant amount of vegetables and sauces. Mozambique cuisine - Present for nearly 500 years, the Portuguese greatly impacted the cuisine of Mozambique. Crops such as cassava (a starchy root) and cashew nuts (Mozambique was once the largest producer of these nuts), and pãozinho (pronounced pow-zing-yo; Portuguese-style bread rolls) were brought in by the Portuguese. Swaziland cuisine is largely determined by the seasons and the geographical region. Staple foods in Swaziland include sorghum and maize, often served with goat meat, a very popular livestock there. Cape Verde cuisine - The Cape Verde diet is mostly based on fish and staple foods like corn and rice. Vegetables available during most of the year are potatoes, onions, tomatoes, manioc, cabbage, kale, and dried beans. Fruits such as banana and papayas are available year-round, while others like mangos and avocados are seasonal. ^ Bea Sandler (1993). The African Cookbook. Diane and Leo Dillon (Illust.). Carol Publishing Group. ISBN 0-8065-1398-5. Archived from the original on 2008-12-16. Retrieved 2008-12-18. ^ a b c Javins, Marie. "Eating and Drinking in Ethiopia." Archived 2013-01-31 at the Wayback Machine Gonomad.com. Accessed July 2011. ^ Kaufman, Les. "Catastrophic Change in Species-Rich Freshwater Ecosystems: The lessons of Lake Victoria". BioScience. 42 (11). doi:10.2307/1312084. ^ Mourad, Mazouz. "The Momo Cookbook." Archived 2011-09-19 at the Wayback Machine The Globalist. Accessed June 2011. ^ a b c "Madagascar." Archived 2011-04-25 at WebCite African Studies Center, University of Pennsylvania. Accessed July 2011. ^ Espagne-Ravo, Angéline (1997). Ma Cuisine Malgache: Karibo Sakafo (in French). Paris: Edisud. ISBN 2-85744-946-1. ^ "Oxfam's Cool Planet - Food in Burkina Faso". Oxfam. Archived from the original on 2012-05-17. Retrieved 2008-05-21. ^ "Archived copy". Archived from the original on 16 August 2011. Retrieved 2017-11-29. CS1 maint: Archived copy as title (link) CS1 maint: BOT: original-url status unknown (link). ^ "Gabon." Archived 2011-10-15 at the Wayback Machine Worldtraveltips.net. Accessed June 2011. ^ "Food habits of rural Swazi households" (PDF). Archived from the original (PDF) on 2011-06-06. ^ "Swaziland Food and Drink". Archived from the original on 2008-09-19. This page was last edited on 20 February 2019, at 05:26 (UTC).